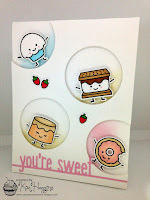 There's a Card for That: Happy Heart Day Series | Hello Cupcake ft Clearly Besotted "Sweet Treats"
Happy Heart Day Series | Hello Cupcake ft Clearly Besotted "Sweet Treats"
Today's card is a quick and easy design that can be duplicated if the need arises. My 5 year old daughter actually came up with the basics for this design when she asked me to stamp some images for her to colour. She likes to pick out the stamps and then tells me where to stamp them with all the seriousness of a structural architect; "no a little bit that way", "can you make the side ones come down so it looks like a rainbow", "Mommy, those aren't even" and so on. She's definitely my little artist and has a great eye for colour and layout. I think it will serve her well in the future. To begin, I stamped the greeting and the three little hamsters from Clearly Besotted "Sweet Treats" with Memento Tuxedo Black ink on 110lb Copic-friendly cardstock, then coloured them with Copic markers. I trimmed the top and bottom of the panel and adhered that to a piece of patterned paper by Lawn Fawn. I then mounted that to the front of my standard A2 sized card base. To finish off the card I used some Nuvo Crystal Drops to create coordinating enamel dots and used Glossy Accents by Ranger on the sprinkles of the doughnut. Oh my....this is just too darn cute! So love that your daughter helped you out, I just love your sweet little critters!!! So much fun. Thank you so much for playing along with us at Muse and at The Card Concept. How cute are these ! I love them and how you have coloured them. So cute, saw it at Muse. Such a sweet take on the MUSE card. Those little guys are adorable! Thanks so much for joining us at Muse this week! Beautiful card Trina, I love these little critters. I have this stamp set on my most wanted list. Perfectly coloured. I love these stamps. They are so cute. The colors you chose work well. This is adorable, and I agree that your daughter really has a great eye for design.